WASHINGTON (AP) — The White House and Republican senators sought compromise Tuesday on limiting presidents’ powers to unilaterally declare national emergencies, as chances improved that President Donald Trump might avoid a long-expected rejection by Congress of his effort to divert billions more for building barriers along the Mexican border. As a Thursday showdown vote in the Senate neared, GOP Sens. Mike Lee of Utah, Thom Tillis of North Carolina and others were talking with the White House about related legislation that would curb the ability of presidents to declare future emergencies. If Trump would commit to signing a bill handcuffing future emergency declarations, more GOP senators might support his border emergency declaration in Thursday’s vote. 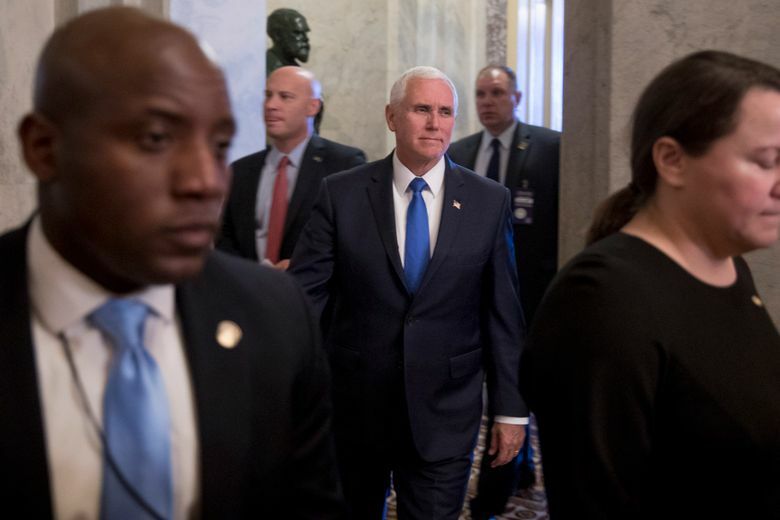 Lee and Tillis were among five GOP senators who met privately Tuesday at the Capitol with Vice President Mike Pence as Republicans sought a way to bolster support for Trump in Thursday’s crucial vote. Since the Democratic-run House voted last month to block Trump, Senate passage of the resolution rejecting the border emergency would send it to the White House, where it would face a certain veto — Trump’s first. By late Tuesday, there were indications that GOP opposition to Trump’s emergency along the Mexican border was softening. If it stands, the declaration would let Trump divert $3.6 billion from military construction projects to build border barriers, even though Congress had voted to limit him to less than $1.4 billion for barrier construction in the budget. Tillis is among four Senate Republicans who have said they’d vote with Democrats to oppose Trump’s border emergency. At a closed-door lunch Tuesday, Tillis suggested he could be open to backing the president, said two people familiar with his comments. One said Tillis told his colleagues he could change his vote if Trump was indeed ready to curb presidential powers to declare emergencies without Congress’ approval. Republicans control the Senate 53-47, meaning that four GOP defections would be enough to send the resolution blocking Trump’s border emergency to the White House. The others are Sens. Susan Collins of Maine, Lisa Murkowski of Alaska and Rand Paul of Kentucky. Paul said earlier this month that there were “at least 10” GOP senators prepared to oppose Trump’s emergency. But he told reporters Tuesday that he now expects fewer defections. GOP senators are “being beaten up right now” to fall in line, he said. “So if you see anybody that’s got blood dripping out of their ear, they may be changing,” he said. If the Senate sends the resolution blocking Trump’s border emergency to the White House, Congress would be highly unlikely to muster the two-thirds majorities needed to eventually override a veto. But final congressional approval of the resolution on Thursday would highlight a clash in which Trump was being forced to protect his signature campaign promise — building a wall along the U.S.-Mexico border — by vetoing legislation sent to him by a Republican-led Senate. Congress has never before voted to overturn a president’s emergency declaration. “They’d like to win and short of that they don’t want a jailbreak” with large numbers of Republicans defecting, Sen. John Cornyn, R-Texas, an adviser to Senate GOP leadership, said of the eleventh-hour White House lobbying effort. Lee’s proposal, released late Tuesday, says a presidential emergency would last 30 days unless Congress votes to extend it. It would apply to future emergencies, not Trump’s current border emergency. A vote on Lee’s plan was expected after Congress returns from a recess later this month. Tillis requested Pence’s meeting with senators, and Pence largely was there to listen, an administration official said. Pence urged them to stand with Trump in Thursday’s vote.